Our group works on mathematical and computational models of quantum many-body systems, mostly nuclei but also the electronic structure of atoms and gases of cold atoms. 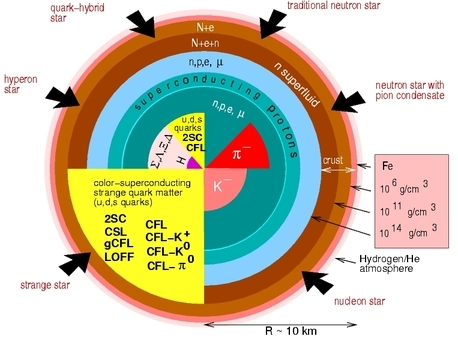 Calculation of weak transitions in nuclei for astrophysics, including electron capture and interactions with neutrinos. Our major tool is diagonalizing the many-body Hamiltonian, a difficult problem which requires sophisticated algorithms implemented on parallel supercomputer. Towards this end we use Fortran 90/95 and MPI and OpenMP parallelization tools. We also develop and benchmark alternate approaches to solving the many-body Hamiltonian. The research is supported by the U.S. Department of Energy and the best students often spend summers at national labs, such as Lawrence Livermore, Los Alamos, and Oak Ridge National Laboratories. Two of our past students have permanent staff positions at national labs. Students who are interested in fundamental physics and have an interest in cutting-edge, hands-on computing will enjoy this research. For more information, contact Professor Calvin Johnson. A schematic illustration of neutron star interiors. A mass of approximately 2 solar masses all squeezed in a radius of about 10 km gives densities 10 to 20 times of nuclear density. These compact object(s) make excellent objects to study matter in the most extreme conditions possible. Dr. Weber’s research focuses on relativistic astrophysics (compact stars such as neutron and quark stars), and General Relativity. Neutron stars, which are formed as remnants of supernova explosions, are among the most unusual objects in the universe. They contain a mass equal to that of the sun in a sphere within a radius of just 10 km. The densities in the centers of neutron stars is therefore 10 to 20 times that of atomic nuclei which make such stars superb astrophysical laboratories for a wide range of physical and astrophysical studies. These range from the exploration of nuclear processes in electron degenerate matter at subnuclear densities, to boson condensation phenomena and the existence of novel states of matter–like the quark-gluon plasma being sought at the most powerful terrestrial particle colliders–at supranuclear densities. Dr. Weber’s research efforts are divided into two major activities. The first activity aims at investigating nuclear, thermal, and electromagnetic processes on the surfaces of neutron stars. The second activity is devoted to the study of phase transitions in the superdense cores of neutron stars where quark matter, boson condensates, and other fundamental particles may exist. Theoretical work on these questions is crucial to obtain the full physics potential of the investments that have been made at Jefferson Lab, the Relativistic Heavy Ion Collider (RHIC) at BNL, as well as new investments that are recommended for RIA (Rare Isotope Accelerator). For more information contact Dr. Fridolin Weber. Currently we investigate the dynamics of associating polymers. In our novel MD/MC simulation the polymers are modeled as strings of beads, the ends of which can connect to each other. These connections are temporary and can break due to temporal fluctuations or applied stress. New connections form when polymers come close to each other. At high concentration and low temperature a network forms (see picture), the topology of which can be characterized using network theory. We currently do this for changes in network topology that occur when the system is under a uniform or oscillatory stress. In the area of biophysics, we study the morphology of the inner mitochondrial membrane. This we do in collaboration with faculty in biology (Dr. Frey) and mathematics (Dr. Salamon and Dr. Nulton). Austin Kruisheer and Mark Wilson in the P-331 lab. Both undergraduate and graduate students are actively involved in this research and most are coauthors of professional publications. Many have attended conferences and presented posters or short talks. UG can join the group during the semester in which they take junior level classical mechanics. Graduate students are invited to join during their first semester at SDSU. Currently summer stipends are available for 2014 and 2015. Students who are already involved in the research are given preference over new students. If you are interested, please stop by my office (room P-134).